It started at Thanksgiving a few weeks ago, when we drove down to my parents’ house with bub in tow and, in the middle of chasing B3 around his newfound wonderland (what are these “carpets” you speak of, and can I crawl around on them forever?) and feeding him pieces of his grandma’s roast duck, I tried a bite of a dish my brother was preparing and was totally blown away. 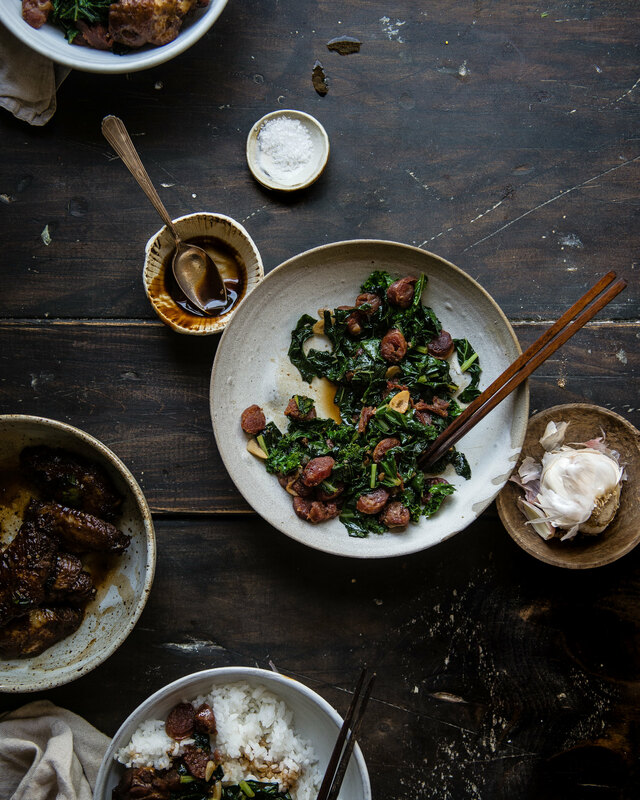 It’s a recipe, I learned, that he picked up from his girlfriend’s mother, which takes water spinach (or kong xin cai) and sautes it until deeply emerald with smoky-sweet lap cheong sausage–my holy grail of smoked, preserved, almost certainly bad-for-you meats–and thin slices of fragrant garlic, then finishes it, in a neat little trick, with a few dollops of glossy teriyaki sauce to make the dish even more wonderfully savory. When my brother made it for Thanksgiving, my mother suggested frying the lap cheong first, before the greens, to let the fat render out. 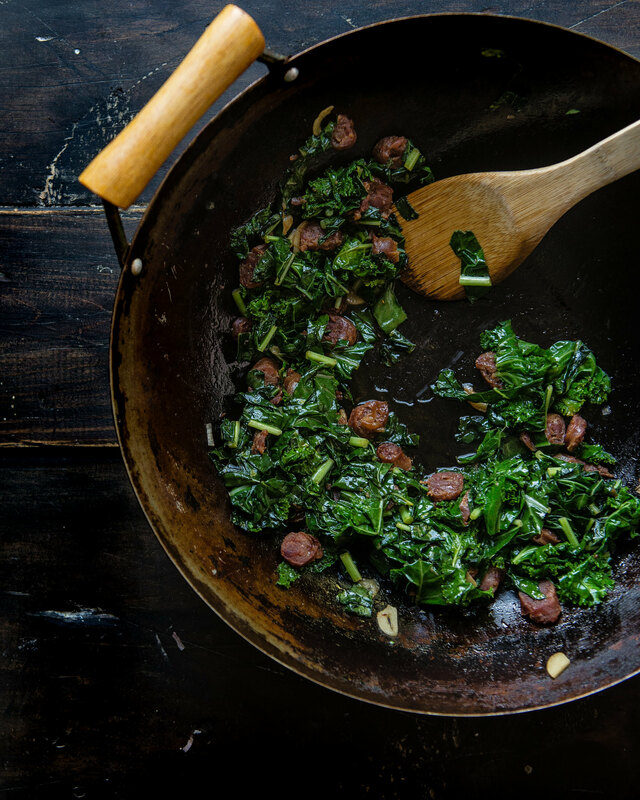 Leave it to my mom to make a great thing even better–letting the impossibly flavorful fat from the lap cheong render into the pan before using it to panfry your greens, and sizzling thin slices of garlic in it, to boot, means that every bite is laced with flavor. The result is an umami bomb (has that phrase been used enough times yet?) 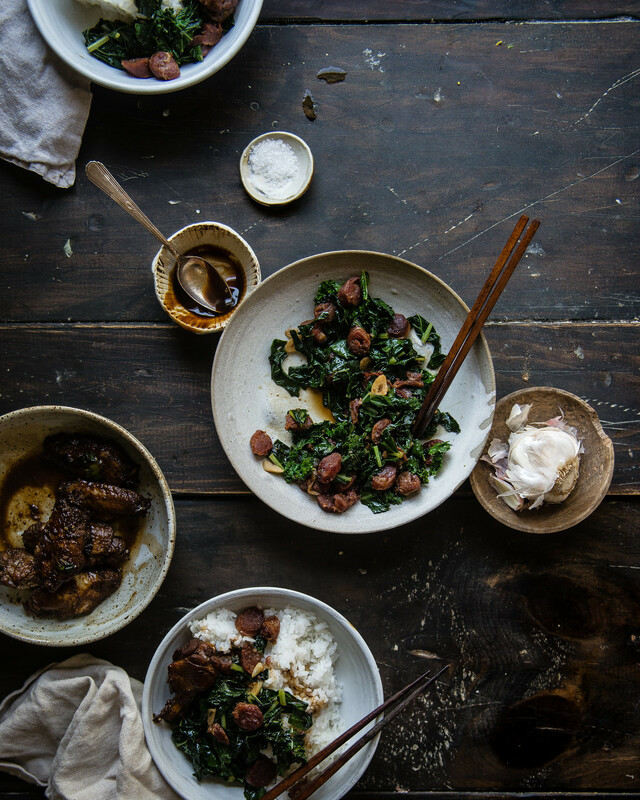 that perfectly balances the bright bitterness of the greens with the sweet-smoky-savoriness of lap cheong and garlic. Back at home and a little ways from a Chinese supermarket where I could pick up water spinach or Chinese broccoli (which you’ll also often find paired with lap cheong), I’ve taken to making this with other hardy leafy substitutes and found that ribboned kale works beautifully, tender when steamed but with a nice bite. Any robust greens with just a touch of bitterness would be great, too, from collard greens (which will need 6-8 more minutes of steaming) to broccoli rabe–the salty-sweet flavors from the sausage and garlic are the perfect way to mellow out sharp brassicas like these, and their brightness, in turn, provide the perfect foil for sometimes-heavy lap cheong. Your only risk is that, once you make this, you might just find yourself spending the holiday season dreaming of greens instead of gingerbread, too. 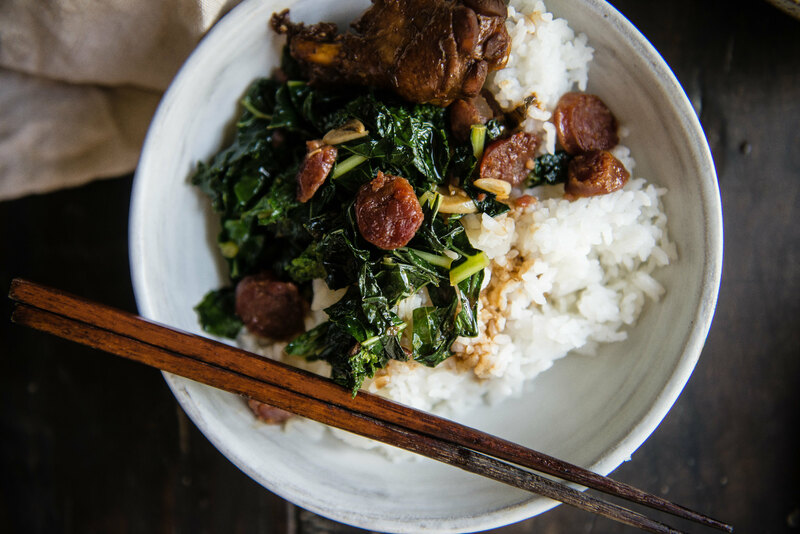 This is traditionally made with water spinach (kong xin cai) or Chinese broccoli. 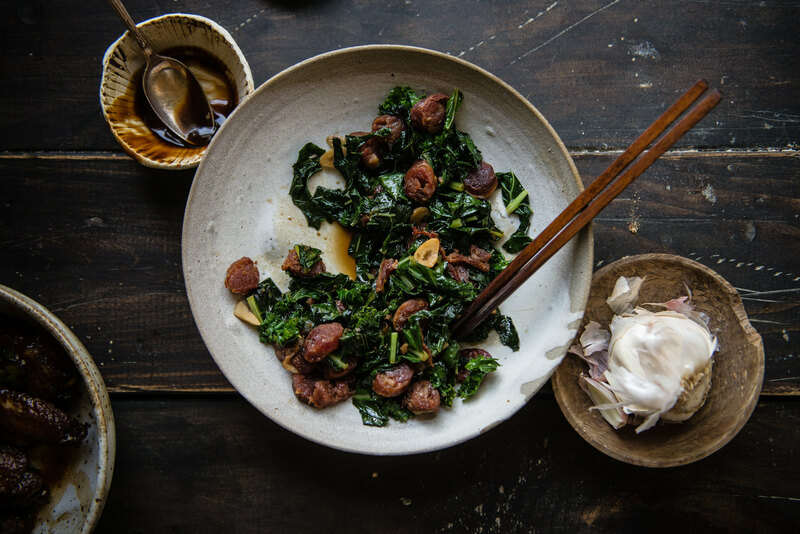 Without access to a Chinese supermarket on most days, I've found that kale or swiss chard work just as well, for a hardy leafy green with a hint of bitterness that perfectly complements the lap cheong and garlic. (The lap cheong, on the other hand, you can order from Amazon!) If you do find water spinach or Chinese broccoli, see Notes below on how to prepare them. Heat a large wok or skillet over high heat. When the wok is hot, add just enough vegetable oil to lightly coat the pan, 1-2 teaspoons, and swirl it until evenly coated. The oil should slide easily around the wok. Add the sausage and garlic. 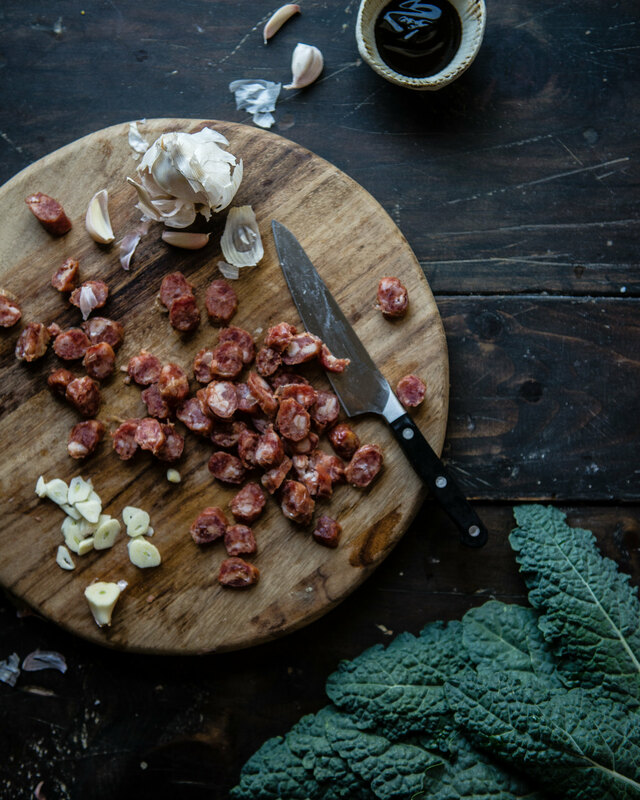 Cook, stirring, for 1-2 minutes, until the fat begins to render from the sausage and the garlic begins to lightly brown and soften. Add the kale and toss vigorously until kale is coated in oil and begins to soften, 2-3 minutes. Depending on how tender you want your greens, reduce the heat to medium-low and drizzle the chicken broth over the greens. Cover and let steam for an additional 2-3 minutes, or until greens are tender. If they’re to your liking after Step 2, skip this step. Add the teriyaki sauce or oyster sauce and toss until evenly incorporated. Serve warm, with rice. Oyster sauce is more pungent than teriyaki, but will add a similar umami boost if you have that on hand instead. If you don't have either, you can mix together 1-2 tablespoons soy sauce with a teaspoon of sugar, and use that. 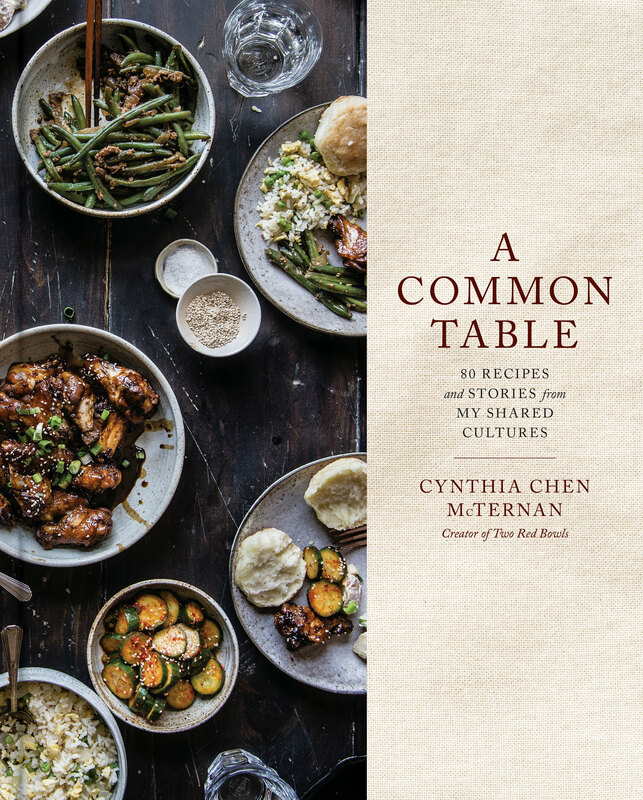 If you happen to have water spinach or Chinese broccoli on hand, separate the stems from the more tender leaves, chop the stems into bite-size pieces, and cook the stems first, for an extra 2-3 minutes, before adding the leaves--the leaves will cook faster than the tougher stems. For the kale, you can remove the tougher ends of the ribs, but I left a bit in towards the middle because I didn't mind them. Wow. This sounds delicious! I can’t wait to try it, I just need to buy the lap cheong sausage next time I’m at the grocery store. I hope you love it if you try it!! Thanks so much, Daniela! I’ve never heard of this, but it looks amazing! I love reading what other people do for holidays, it gives such a great insight into traditions! I agree–holiday foods are the best, so full of good food memories 🙂 Thank you so much, Abby! 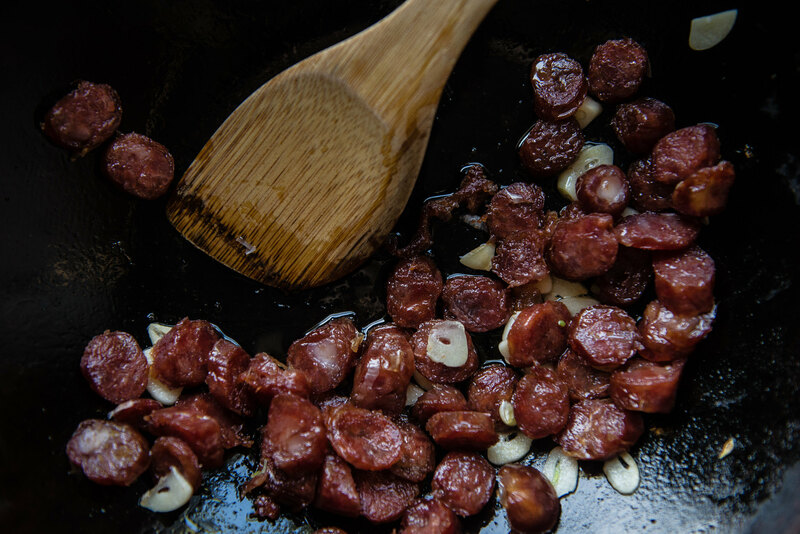 I know that Chinese sausage can be generically labeled lap cheong – should I be looking for the dried kind, or fresh? Hi Halley, good question! I used Kam Yen Jan brand here, which is dried, but I think you would be fine with any kind, as long as you like the flavor. I hope you love it if you try it! 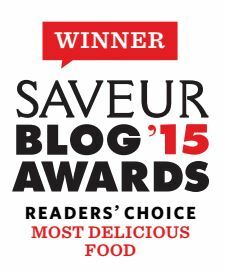 this looks delicious, I wonder if the sausage has any sugar in it, I’m trying to eliminate any and all refined or artificial sugar from my diet, natural sugars like in fruit is ok, no dairy or simple carbs as well. Hi Gilbert, thank you so much! Unfortunately, yes, the lap cheong generally is cured with a mix of things that includes sugar, and the teriyaki sauce will also contain some sugar. I could still see this working well with another kind of sausage, though! 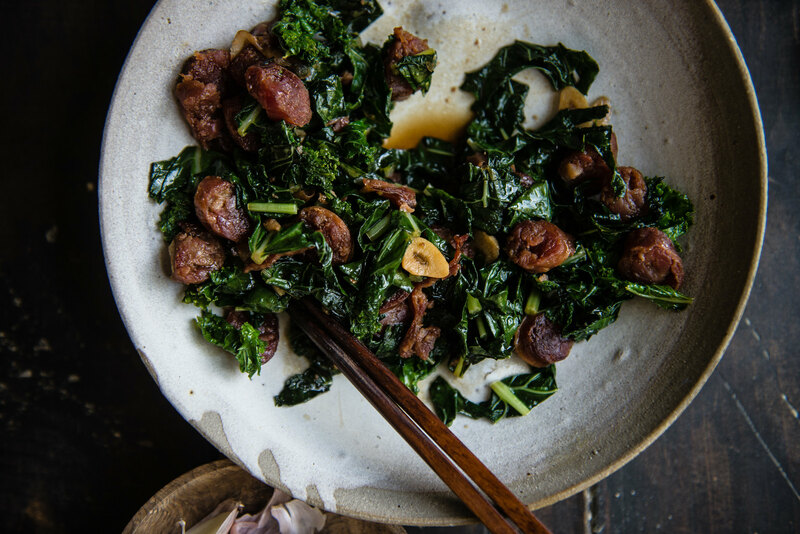 Perhaps spicy Italian, with a bit of Parmesan at the end–it would be like a sausage and kale pasta but no pasta! If you try it, I’d love to hear how it turns out.